A transformational experience to get back in touch with yourself, your relationship with your reality and your dreams. This retreat is time to re-connect with your true nature and essence—a new beginning and a launch pad for a new way of living. You will regain the footing on your path of truth. Of course, this is not just an educational experience—it is also a week of relaxation and pleasure. You can indulge in restorative massage, savour local fresh organic meals and rejuvenate with deep sleep. You will not need to think about comfort, it will be there for you in abundance, with daily maid attended and luxurious rooms, guided meditations and rituals, and vibrant andwholesome meals—all the smaller details that make you feel at peace, so you can do your inner work. We will begin every morning with guided and sometimes silent meditation; we learn to keep focus inwards to prepare for further practice. Our morning continues with soulful chanting and a dynamic Vinyasa and totem animal yoga practice, inspired by ancient shamanic practices. The intention is for you and your body to be awake, peaceful and in balance. Every day we will learn how to create Sacred Space, to perform ritual, ceremony and inner connection, and how to energetically cleanse the home, work space, dis-ease in others and yourself. In the evening we will come together to learn practical shamanism and how to bring healing into your life and the lives of those who seek healing. We will share knowledge and impart wisdom on the art of letting go of your pain and of working toward the manifestation of your hearts desire. We will explore and understand how to access the heart, your hearts desires and own sacred destiny. You will re-familiarize yourself with the sacred art of magic; the mysterious connective force behind all and everything. You will be introduced to some sacred chants (songs) and learn about their meaning. We will experience the positive effects they have on the mind. There will be time to dance and move together, to explore the island and to find your own quiet contemplation. We will come together to safely experience plant medicines with the intention of opening our hearts and our minds to our own inner truth, which is essentially what this retreat is ultimately for. A boutique villa nestled on a hillside with a view over a deep green and blossoming Ibiza valley. With only 7 en-suite bedrooms, Villa Ses Palmeres offers tranquility and privacy. Each room is lovingly decorated in neutral and calming colours to allow deep relaxation. The villa is fully air conditioned and daily maid service is included. The vast garden area with a private swimming pool invites to take a cool dip and soak up the sunshine. The villa has been fully refurbished in 2018 and boasts a newly built and covered yoga deck in the garden. 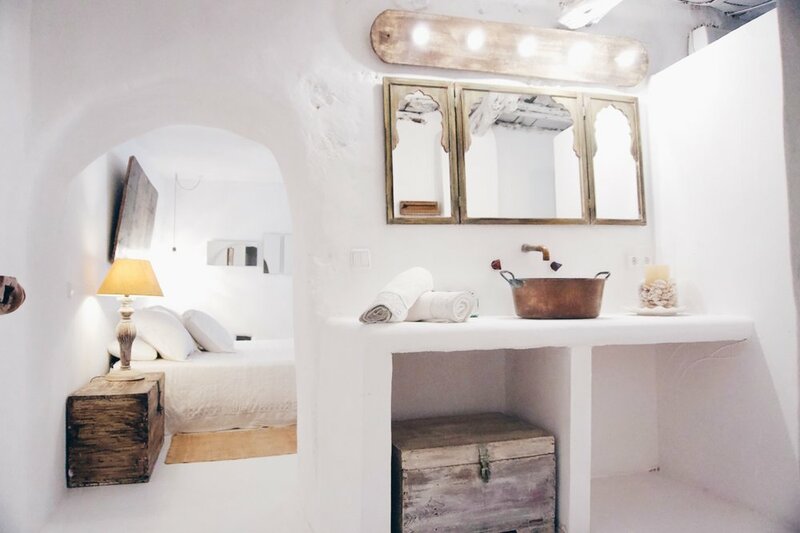 These lush, light-filled rooms come with one plush Double bed and an en-suite bathroom. Book for yourself or share with a friend. These rooms come with two twin beds dressed in fine, fresh linens and an en-suite bathroom.